Aircraft in Squadron 3 pcs. 127 mm/51 Mk74 х 1 pcs. 12.7 mm Browning M2 mod. 116 х 1 pcs. Langley — American Tier IV aircraft сarrier. The Langley has the unfortunate distinction of being the slowest aircraft carrier in the game. If discovered, it can't get away from anything - not even battleships. Keep an eye on your map and start moving long before enemies get near detection range. With only one squadron each of fighters, torpedo bombers, and dive bombers, Langley commanders will have to make sure that every strike mission counts. The carrier itself starts with no AA armament whatsoever. It does have four 127 mm cannons which will sink a heavily damaged destroyer on occasion, but their range is pitiful. It is highly recommended to stay back and hide, or try and stay with the team. Has aircraft in large squadrons where most ships of that tier have little or no anti-aircraft capabilities. Not easily detected, around 10km detection from the surface if exposed. Able to deploy 3 squadrons, one of each type. Weird hitbox of the ship may confuse attackers and make them miss their shells through the large gap between the hanger and the flight deck. Once upgraded, it gains some AA that can fend for itself against equivalent tier planes. Incredibly slow, top speed being around 15 knots ,and, slow turning; requiring more space to turn than most battleships and carriers. Like all low-tier carriers, it's hopeless once found. Nearly no armor, getting citadeled by most HE shells easily. Research the Grumman F3F fighters first for a 27% increase in damage, more speed, and more survivability. Research the Vought SBU dive bombers next for a 12 knot increase in speed. Research the Martin T4M torpedo bombers for more survivability and a small speed increase. As a carrier, Langley can only mount at most four signals at a time and has no risk of detonating. Players should mount Equal Speed Charlie London ( ), Zulu Hotel ( ), November Echo Setteseven ( ), and Juliet Whiskey Unaone ( ). Players can also choose to equip the Dragon Flag ( ) for faster commander (re)training. USS Langley (CV-1/AV-3) was the United States Navy's first aircraft carrier, converted in 1920 from the collier USS Jupiter (AC-3), and also the U.S. Navy's first electrically propelled ship. 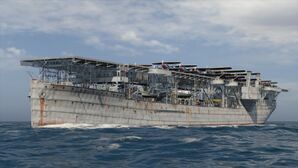 Conversion of another collier was planned but canceled when the Washington Naval Treaty required the cancellation of the partially built battlecruisers Lexington and Saratoga, freeing up their hulls for conversion to the aircraft carriers CV-2 and CV-3. Langley was named after Samuel Pierpont Langley, an American aviation pioneer. Following another conversion, to a seaplane tender, Langley fought in World War II. On 27 February 1942, she was attacked by dive bombers of the Japanese 21st and 23rd Naval Air Flotillas and so badly damaged that she had to be scuttled by her escorts. Jupiter 16 October 1913, the collier, before conversion to Langley, the aircraft carrier. Langley being converted from a collier to an aircraft carrier at Norfolk Naval Shipyard in 1921. US fleet at Guantanamo Bay, 1927. Visible amidst about 15 battleships at the top of the photograph, is the aircraft carrier USS Langley. Langley after conversion to a seaplane tender, 1937. This page was last modified on 4 April 2019, at 20:22. This page has been accessed 72,954 times.